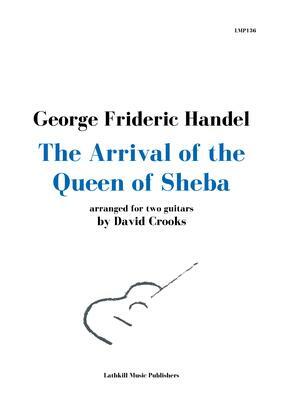 The music popularly known as "The Arrival Of The Queen Of Sheba" is in fact the orchestral introduction to Act III of Solomon, an oratorio written in 1748 by the German composer G.F. Handel. It is a lively piece in the late Baroque style and is often used at weddings to accompany the arrival or departure of the bride. This arrangement is based on a contemporary reduction for keyboard and follows it exactly, apart from octave transpositions. It is presented here in the key of A, but guitarists may play it in the original B flat by using a capo at the first fret.